Gigabyte GA-8KNXP Ultra-64 PCSTATS Review - Hance Rapids and PCI-X? The key which differentiates the Gigabyte GA-8KNXP Ultra-64 from all other consumer i875P motherboards is the Intel 6300ESB (Hance Rapids) southbridge. The Intel 6300ESB has support for the usual connectivity we expect like Serial ATA, Ultra/100 IDE, AC'97 audio and a half-dozen USB 2.0 ports. 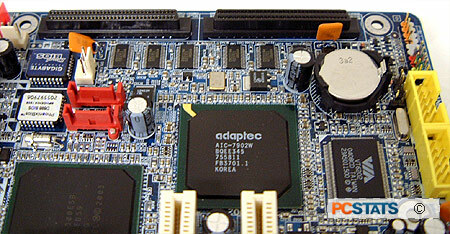 What makes a motherboard with the Hance Rapids Southbridge special is obviously its support PCI-X slots. The standard 32 bit PCI interface remains more than sufficient for the applications most users demand of their home or office PCs, but some devices just demand more bandwidth than a 32-bit PCI slot can offer up. This is where PCI-X comes in. It actually stands for PCI eXtended, and extended is a good way to think about PCI-X cards, because that is exactly what they are, an extension of the PCI bus. PCI-X should not be confused with PCI Express, the two are completely different, and not interchangeable although the names sound very familiar when spoken aloud. PCI-X slots are intended for workstation situations, and allow the PC to advantage of higher bandwidth 64bit PCI-X devices. These could be Gigabit network cards, fibre channel, SCSI or RAID cards, or other more specialized devices that would be more at home in a server environment than under a desk. Running on 3.3V (as oppose to 5V for regular PCI rev 1-2), PCI-X is the 64 bit solution that runs at 66 MHz. Each PCI-X slot provides 266MB/s of bandwidth, double that of PCI, and has a 533MB/s connection to the southbridge, so there is plenty of bandwidth to go around. As you probably guessed, the PCI and PCI-X slots on the GA-8KNXP Ultra64 do not share the same bus to the Intel 6300ESB. Rather, the two PCI-X slots have their own private and direct connection. 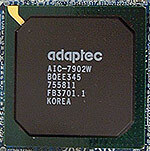 In fact, the onboard Adaptec AIC-7902 Ultra/320 SCSI controller makes use of its own PCI-X connection to the Intel 6300ESB, rather than sharing the PCI bus with other system devices. With a maximum throughput of 320MB/s, the Adaptec SCSI controller could potentially saturate a PCI bus. There is much more to this topic than we have covered here, and configuring a computer system with SCSI drives can certainly bring about certain performance enhancements. That is beyond the scope of this review however. Now, let's have a look inside the GA-8KNXP Ultra's BIOS. Pg 2. — Hance Rapids and PCI-X?